A 4 star botique resort on white sand Tubkaak beach overlooking the magnificent Hong islands. All buildings are built villa style in southern Thailand architechure. 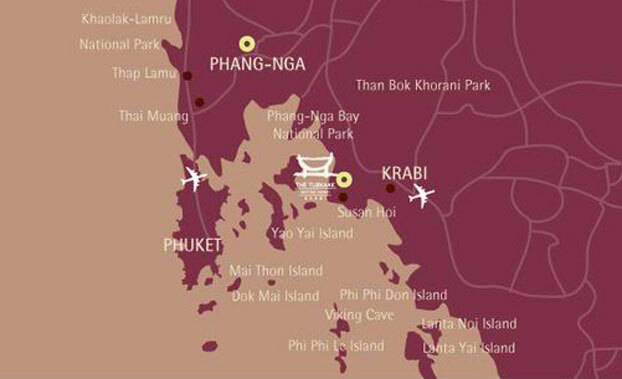 Tubkaak Krabi is 120 minutes from Phuket international airport, 45 minutes from Krabi airport, 30 minutes from Krabi town, and 20 minutes from Ao Nang beach. Located at Tubkaak Beach, overlooking the magnificent Hong Islands, it's an ideal getaway. You'll find no large hotels nearby, no crowds, just calm tranquility and perfect peace, well beyond the gypsum pier near Ao Siew, surrounded by the stunning natural beauty of Krabi, Thailand. A freeform swimming pool with jacuzzi, the spa, the library. Excursion to nearby islands, fishing, scuba diving, snorkeling, and golfing nearby. Les Artists (minimart and sundries). Major credit cards accepted. Foreign currencies exchange. Laundry service. Transportation. Car rental. Tour arrangement. Doctor on call. Terrace, air-conditioning, outdoor sunken bathtub and separate shower, refrigerator, hair dryer, satellite TV, IDD telephone, personal safe, tea and coffee making facilities, ceiling fan. All rooms are located on the ground level of the two-storey villa and all rooms feature king size bed only. Air-Conditioning, outdoor sunken bathtub and separate shower, refrigerator, hair dryer, satellite TV, IDD telephone, personal safe, tea and coffee making facilities, ceiling fan. 16 Rooms are located on the upper level of the two storey villa. Balcony, air-conditioning, outdoor sunken bathtub and separate shower, refrigerator, hair dryer, satellite TV, IDD telephone, personal safe, tea and coffee making facilities, ceiling fan. Terrace with sea view, air-conditioning, outdoor sunken bathtub and separate shower, refrigerator, hair dryer, satellite TV, IDD telephone, personal safe, tea and coffee making facilities, ceiling fan, compact disc. The resort sells rooms along with breakfast and a halfboard system in which each client is accredited an amount of Thai Baht per day and it can be used for food and beverage consumption except Gala Dinners The credit is accumulative during the period of stay valid in all restaurants and bar, except room service. Car transfer service from and to Krabi airport can be requested for a fee. The Tubkaak Resort Krabi. 123 Moo 3, Tubkaak Beach. Tumbol Nongtalay, Amphur Muang. Krabi 81000. Phone : 075-628 400. Fax : 075-628 499.